Go the Distance May is a month-long event highlighting the importance of physical activity in a healthy lifestyle. Schools and youth organizations across Iowa can take part by planning a 30-minute physical activity event to get kids moving. This free event, celebrating active and healthy kids, can take place any day and time from May 1-31. Active events could include obstacle courses, fitness stations, nature hikes, group dancing, and much more! 3. Share your event and be eligible to win cash prizes! Live Healthy Iowa Kids is excited for the opportunity to award 1-$500 and 2-$250 cash prizes for Go The Distance May! 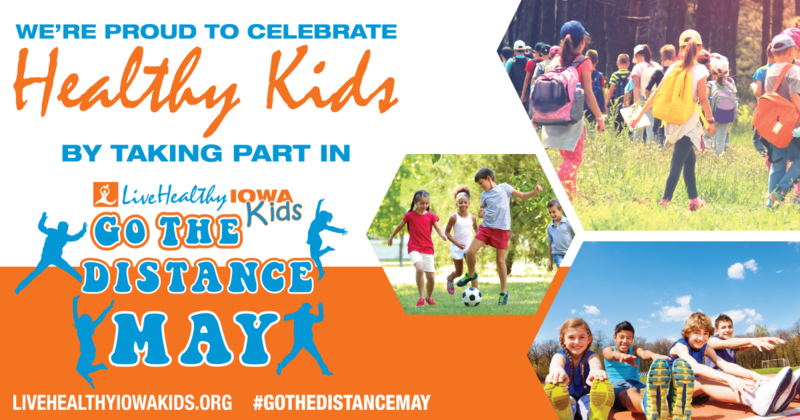 To be eligible, share your registered event on social media, tagging Live Healthy Iowa and using #GoTheDistanceMay, or submit photos via email to info@livehealthyiowa.org.